We offer last minute specials! Call us if you are doing a spontaneous night out, or if you forgot to plan that special evening. 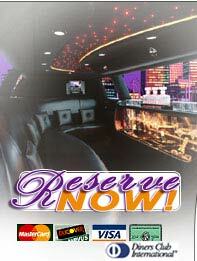 Call to see if we have a limousine available on our "last minute" special promotion. Get the 5th hour free! We are the only Limousine service in the Valley who offers a wedding transfer package 7 days a week. (Including Friday and Saturday nights). Excluding major holidays. To get an up-to-date quote from one of our sales representatives, or to book a Limousine for your occasion, Contact Us.